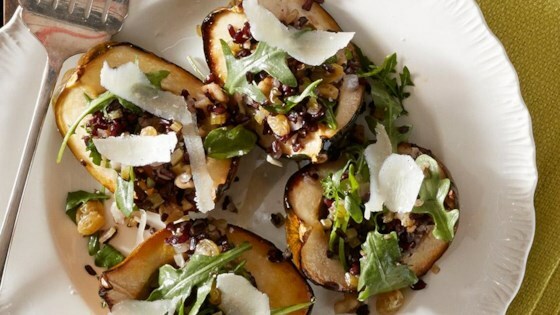 "Savor the flavors of the season with this vegetarian dish from Sara Forte of Sprouted Kitchen." Preheat the oven to 400 degrees F. Line a rimmed baking sheet with Reynolds Wrap(R) Aluminum Foil. Rinse the black rice. Add rice to 1 1/2 cups of water. Bring it to a boil then reduce to a simmer. Cover and cook for 45 minutes until cooked through. Remove the lid, fluff with a fork and leave the lid ajar to cool. While the rice cooks, roast the squash. With a sharp knife split the squash into quarters. Remove seeds and rub both the flesh and skin with olive oil and sprinkle with sea salt. Spread them on the foil-lined baking sheet cut side up and roast for 40 minutes until tender and browned in spots. Prepare the stuffing. Warm 2 teaspoons of the oil over medium heat in a pan, saute the onion and celery until just softened, about 4 minutes. Transfer to a mixing bowl. Grind the fennel seed or chop well with a sharp knife. Add fennel, 1/2 cup of the walnuts and raisins and drizzle with the remaining oil, maple syrup and vinegar. Toss to coat. This much can be done a day in advance and brought to room temperature before serving. When ready to serve, arrange the squash wedges on a platter. Toss the arugula in with the rice stuffing along with a few pinches of salt and pepper and toss again. Fill the insides of the squash with the stuffing; it is ok if a bit spills over. Garnish with the remaining walnuts and fresh shaved Parmesan and serve. Sick of food getting stuck to your baking sheets? Next time line them with Reynolds Wrap® Aluminum Foil for hassle-free cleanup!